This recipe is one of the weirdest but most delicious ice creams that I have ever had! I found it at www.thepaleomom.com but modified it slightly. The key is to use a very good quality organic, extra virgin olive oil. Olive oil is the healthiest when it is not heated so this recipe helps you reap all of its benefits. When you heat any oil to their smoke point, the antioxidants can decrease. Extra-virgin olive oil has a high smoke point compared to cheaper olive oils, somewhere between 365 and 400 degrees F. You also wanted to store your oil in a cool, dark place to maintain the antioxidants. Believe it or not, some of my Italian family members don't like olive oil so I substitute 1/2 avocado oil for them. Me, I am a diehard, and love the olive oil flavor! Trader Joe’s doesn’t have guar gum—true GAPS™ patients make their own, as there are several concerns with all cans—BPA free can mean BPS which can be even more toxic. I found this recipe even better with less honey. I used ¼ cup, so experiment according to your own taste. **You can also add another 1/4 tsp. 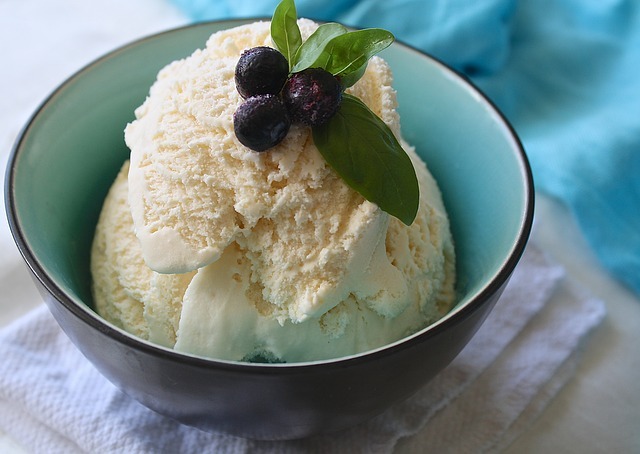 almond or orange extract to add more flavor to the ice cream. 1. Heat the coconut milk on medium-low heat. Stir frequently with a whisk until hot and steaming, but not simmering (don’t let it simmer). 2. Separate the eggs (you can freeze the whites and make macaroons or meringue). 3. Put the egg yolks in a glass bowl (something that can tolerate heat such as Pyrex or a metal bowl). Temper the yolks by adding a ladle of hot milk to the yolks while still whisking the yolks. Now add the yolk mixture back to the saucepan, whisking constantly so the eggs don’t curdle. 4. Heat this mixture on medium-low heat, continuing to stir/whisk. Don’t let the mixture simmer. It takes about 6-8 minutes for this custard to thicken. If it happens to curdle from overheating, put it in the blender until smooth. However, you don’t really want this to happen. 5. Remove the mixture from the heat and pour into a Pyrex or metal bowl. Let it cool to room temperature. 6. Add the rest of the ingredients. Put it all in the blender to fully incorporate. 7. If you are using an ice cream maker: Chill the custard in the fridge until cold. Then place it in the ice cream maker and follow the directions. Once it’s done, pour it into the freezer-safe container and freeze for 1-4 hours to harden it a little more before serving. If you are using a blender: Place custard in a freezer-safe bowl and freeze until mostly solid—about 4-6 hours. I put it in a metal bowl or bread loaf pan. You can also use Pyrex/glass. Whisk every hour to ensure that ice crystals don’t form. You can take it out at the end and put it in the blender (or a Vitamix or Blendtec) to make it like custard before serving. I just scoop it out of the pan, and it has a texture similar to gelato. 8. You can top with with a flavored vinegar (e.g. orange or balsalmic). You can also top it with some berries or fruit of your choice.